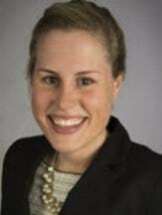 Megan Wallin is a native of Montgomery, Alabama, and attended the University of Alabama where she received her Bachelor of Arts in English and was a member of the International Honors Program. Megan earned her law degree from Mercer University's Walter F. George School of Law with a Certificate in Advanced Legal Writing, Research, and Drafting. After law school, Megan worked at a family law firm in Atlanta until joining Laura Thompson in Newnan, Georgia. During her previous employment, she co-authored an article on Social Security Disability and worked on several Georgia Court of Appeals Briefs. Megan practices primarily in the area of Family Law, handling divorces, child custody matters, legitimations, modifications and contempt actions. In addition to divorces, Megan handles stepparent, relative and third party adoptions. Megan can also handle the division of assets incident to a divorce, which includes Qualified Domestic Relations Orders (QDRO) for 401(k)s and pension plans and Military Pension Division Orders (MPDO). Megan is a member in good standing with the State Bar of Georgia, and is a member of the American Bar Association, the Family Law Section of the State Bar of Georgia, and the Military and Veterans Section of the State Bar of Georgia.